The first light of moonrise illuminates the entire San Rafael Reef, the colors enhanced by the camera’s long exposure. 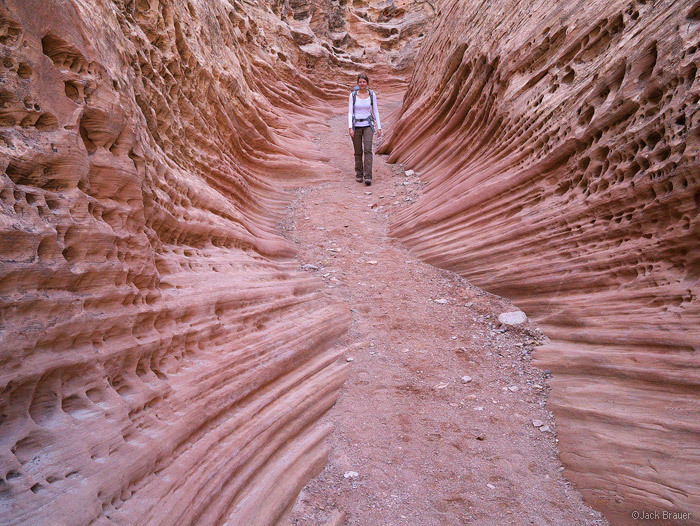 Walking through the narrows of Eardley Canyon. Sunrise light on the San Rafael Reef, above Black Dragon Canyon. The San Rafael Reef is the jagged uplifted eastern edge of the greater San Rafael Swell, a giant dome-shaped anticline rising to the west of the Green River in central Utah. People who have driven Interstate 70 west of Green River will likely remember the incredible highway route that cuts right through the vertical red walls of the San Rafael Reef. Though most travelers blow through the Reef at 70 MPH, in mid-April we spent a week hiking in, on, and around the San Rafael Reef to the north and south of the highway. 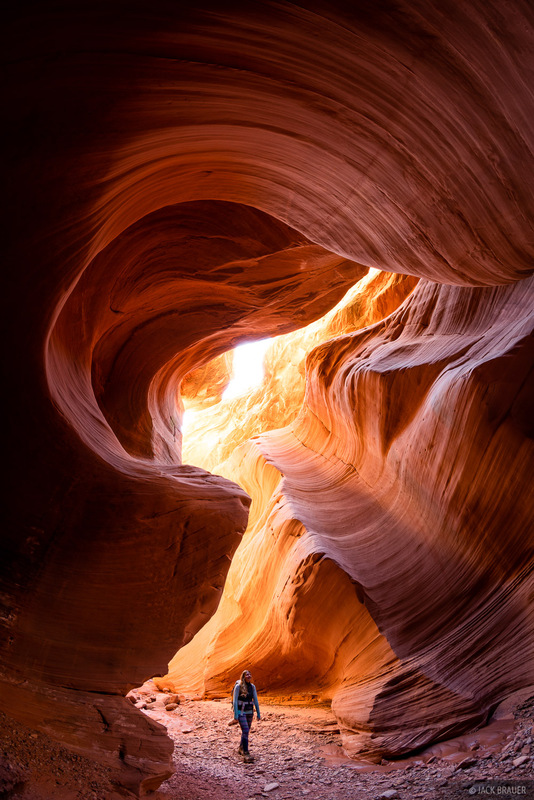 This often ofterlooked region boasts amazing geologic wonders and a seemingly endless array of canyon and slickrock adventures and solitude. 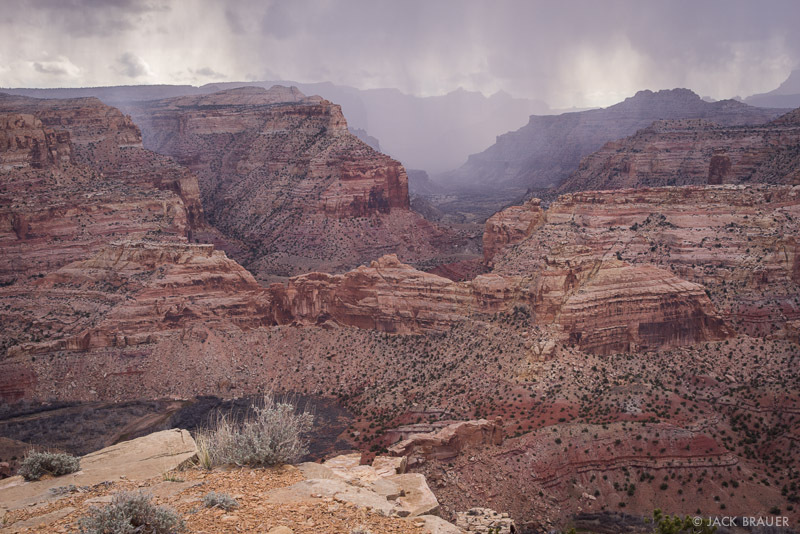 Posted in Deserts & Canyons and tagged San Rafael Swell, Utah on April 19, 2017 by Jack Brauer. If you’re wondering why I haven’t posted here in a while, it’s because we just got back from a 3-week desert road trip! Our main reason for the trip was to visit my grandma in California on her 100th birthday! And the late October timing was perfect for extending the journey into a long road trip to some desert locations between here and there. Over the next days I will post a bunch of photos from each adventure. 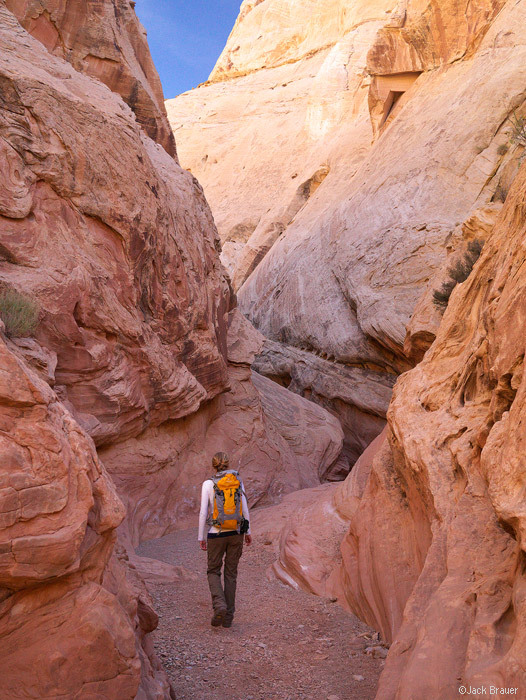 Our first little adventure was a quick hike through the popular Little Wildhorse Canyon in the San Rafael Swell in Utah just off I-70 on our way towards California. 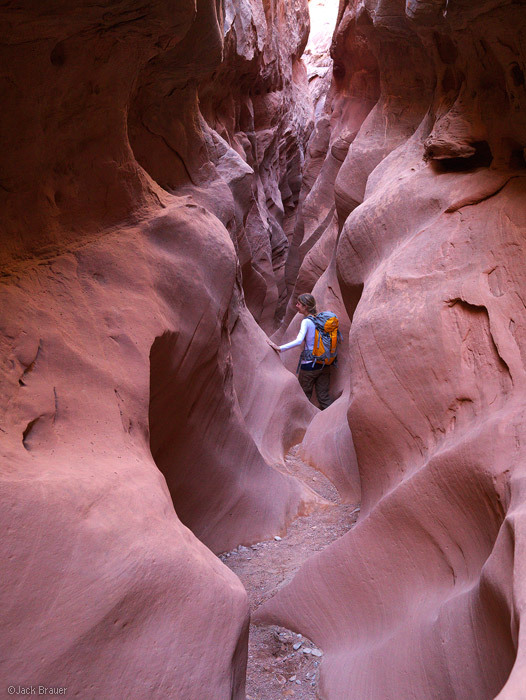 This is a great little canyon hike with some really interesting, fairly sustained narrows and slot sections. I thought this hike was kind of popular when I first did it a couple years ago. But that was nothing compared to the crowds we encountered this time! I’ve never ever seen this many people on one hike in the desert, except maybe in Zion NP. We happened to time our hike the same as seemingly every boy scout group in the state of Utah, and there were hundreds of boys running up and down the narrow canyon. Kind of annoying at first, but also pretty neat to see all the kids enjoying the awesome canyon. Because we still had to hit the road for another long drive that day, we turned around after the most interesting narrows and backtracked to the trailhead, instead of doing the usual longer loop hike. We soon realized that this was probably a bad idea, since we were then going against the flow of the mobs of hikers through the narrow slots! This meant lots of waiting while we let group after group pass us by. Anyhow, despite the crowds, this canyon is always a fun one for a quick dayhike. And, thank you Claudia for your patience posing for all my pictures! 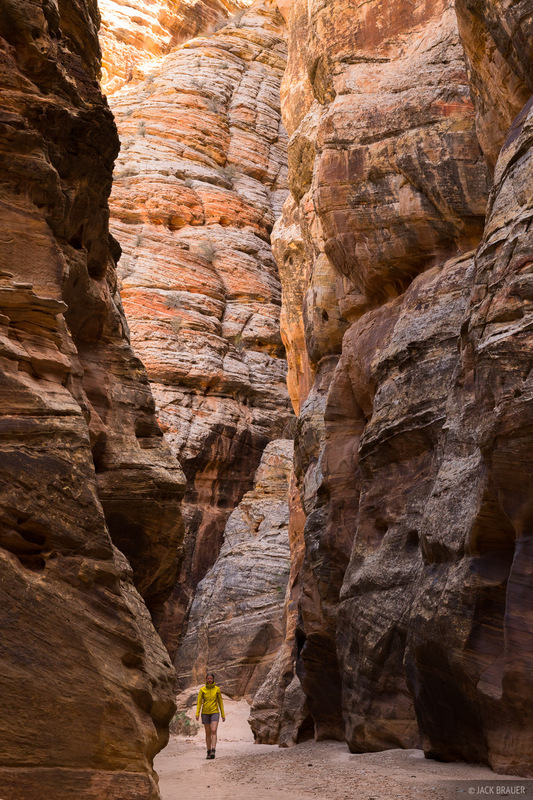 Posted in Deserts & Canyons and tagged San Rafael Swell, Utah on November 8, 2012 April 16, 2014 by Jack Brauer.